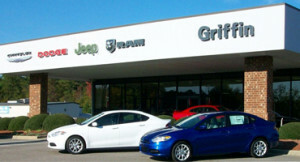 The Griffin Automotive Group consists of Griffin Chrysler Dodge Jeep Ram, Griffin Toyota and Griffin Nissan. 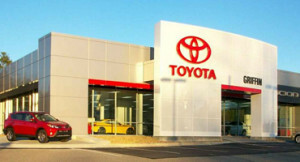 We specialize in the sale of new cars and used cars as well as new and used trucks and vans. Our exceptional customer service is well known all over North Carolina and South Carolina but we are especially proud to serve our friends in Lumberton, Rockingham, Hamlet, Laurinburg, Bennettsville, Wadesboro, Cheraw, Ellerbe, Maxton and Laurel Hill as well! 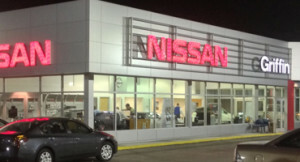 Our award winning cars and trucks include Ram Trucks 1500, 2500, 3500 Big Horn, Laramie, Wrangler, Sahara, Rubicon, Avenger, Patriot, Compass, Caliber, Journey, Commander, Sebring, PT Cruiser, Challenger, Charger, Laredo, Patriot, Grand Cherokee, Toyota, Camry, Corolla, Avalon, Prius, Tacoma, Tundra, Venza, FJ Cruiser, Land Cruiser, Sienna, Rav4, Highlander, Matrix, Yaris, Scion, xb, tc, xd, Hybrid, Nissan, Altima, Maxima, Versa, Sentra, Leaf, Pathfinder, Xterra, Frontier, Titan, Rogue, Murano, Cube and Juke! Powered by Jenntel. ©Copyright 2019.